Visiting Milan on a budget is a noble goal, but many tourists in Italy are more intent on seeing Venice, Florence, or Rome. Some mistakenly view Milan as just another big city with little to offer beyond a transfer connection to the Swiss Alps or the Venetian lagoon. But Milan is one of the world's fashion capitals. It is home to one of the world's most famous works of art. Milan can serve as a hub for visiting other points in northern Italy such as Lake Como or Lugano. The city is well-connected by rail and air to other major cities in Europe, and budget airline routes. The mild climate found further south in Italy is elusive here. Remember that the Alps are only a short distance to the north, and winters can be cold, with occasional snow. May and October are the rainiest months, but the trade-off during those times is mild temperatures and fewer tourists. Summers are warm, with high relative humidity. The Lombardy region is served by three airports. Pay attention to the arrival and departure airport before booking, because some involve considerable ground transportation expense. Malpensa (MXP) is the largest airport, but it is quite removed (50 km. or 31 mi.) from the city center. An airport train makes dozens of runs across that distance at prices far cheaper than a cab. The station is located in Terminal 1. Linate (LIN) airport is the closest to the city center, but it is a small, older airport that serves domestic and European routes. Orio al Serio or Bergamo airport (sometimes called Milan Bergamo) serves a number of low-cost carriers but is 45 km. (27 mi.) from Milan. A bus service connects the two points for a low fare. Bergamo might be your best bet for finding cheap flights. The airport is gaining popularity. In most world cities, pizza makes for a cheap meal. Milan offers a host of low-cost pizza options, including Mr. Panozzos in the Citta' Studi area. Pizzas that earn good reviews can be purchased at modest expense. You'll find a host of budget eateries in Milan, but don't forget to save for a splurge or two. Milan offers a wide variety of cuisine, and sampling is part of the experience. Visit a neighborhood trattoria, where you'll find friendly proprietors and lots of neighborhood patrons. Il Caminetto receives good reviews and prices are moderate. In many Italian cities, hotels near the railroad stations are bargain-priced, and Milan is no exception. But some budget travelers prefer a short jaunt northeast of the city center to the Citta' Studi neighborhood, which features a number of family-owned, no-frills establishments. Priceline can work well in this city. Be aware that at certain times of year (fashion expos are good examples), the inventory of Priceline rooms in Milan will be scarce. At those times, it's best to skip the bidding and reserve well in advance. Airbnb is also worth a look. Be sure they're well-connected to public transportation. Ground transportation in the Milan area is tailor-made for budget travel. This transportation hub is home to five railroad stations and four subway lines. The subway is known as Metropolitana, and it allows the purchase and validation of tickets via smartphone. Rides are inexpensive, and a weekly pass is available at a reasonable cost. Consider that a cab ride into central Milan from Malpenza Airport can cost $100 USD. Milan also offers excellent public bus options. Bus #94 continuously circles the center of the city and has attracted more than a few tourists. BikeMi! is Milan's bike sharing system. A daily subscription is quite reasonable, and there are several hundred stations in the area. The prominent Castello Sforzesco and its fortifications are clearly visible from the city streets, and only a modest entrance fee is required to explore beyond the gates. This beloved structure, now a cultural icon, was at one time reviled as a symbol of tyranny. Enjoy the colorful stories here on a guided tour as you learn more about the history of Milan. There is much value to be gained here. Don't be afraid to invest at least half a day. A favorite stop in Milan is Santa Maria delle Grazie, where Leonardo DaVinci's incredible fresco Last Supper is displayed. Seeing this masterpiece requires some planning. Reservations are required, and careful efforts are made to ensure that no more than 30 people are in the viewing area at any given time. You'll also be limited to a maximum of 15 minutes. Purchase your reservation online through Turismo Milano, and be prepared to do so well in advance of your visit. In fact, a standard lead time is about four months. Cutting it any closer might risk disappointment, given the tight limitations on visits. Guide services offer a bypass of the lines if you're willing to pay more than the cost of the reservation. Given the time investment, it's worth considering. Musement.com offers a tour/line bypass combination ticket. 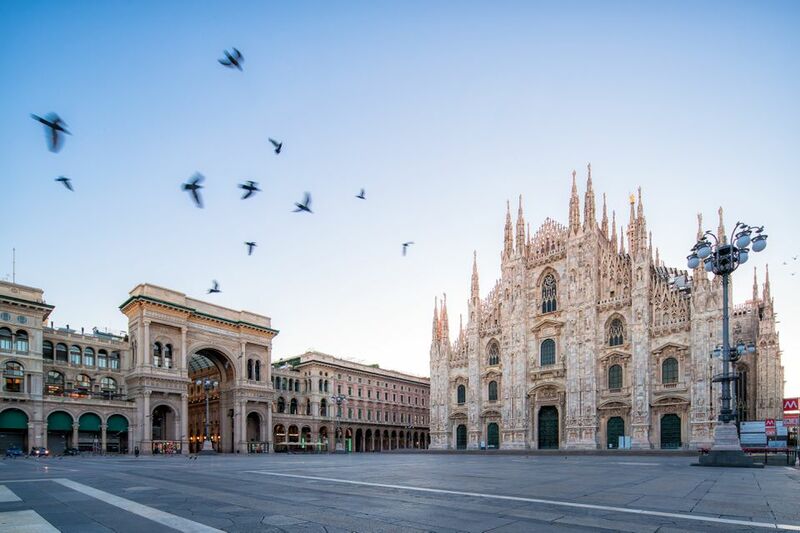 One of Europe's most photographed buildings is Milan's famed Duomo, which astounds visitors with its artistic facades and spectacularly stained glass windows. Keep in mind that although entry is free, you are not allowed to bring in large bags. You may check your bags for a modest fee. Crowds can be large here, so plan to go early in the day if possible. Many visitors combine their Duomo visit with a trip to Galleria Vittorio Emanuelle II, just a few steps away. Built in 1865 and restored several times since, this was Italy's first structure made from iron, glass, and steel. It's claimed that this is the world's oldest continually used shopping structure. Budget travelers will find most prices well beyond their means, but window shopping costs nothing. Milan makes an excellent travel hub for exploring the Lombardy region of Italy. Its rail connections and a larger selection of hotels can be used to your budget travel advantage. Lake Como is only a short train ride from central Milan. If you can't spend several days there (highly recommended), it can make an excellent day trip. Brescia also makes a good day trip, offering an outstanding preserved old city and castle. Mantua is part of a UNESCO World Heritage area, featuring renaissance architecture and the fascinating Ducal Palace. Get a Milano Card: This card is designed to provide a series of discounts on transportation and attractions. Purchase by days spent. The cards are not transferable and operate on an hourly basis. The clock starts with your first public transportation use, as travelers acquire the pass upon arrival at airports or train stations. Take a walking tour: Milan Free Tour offers a 3.5 hour guided walking tour that can be a great orientation on your first day. Please offer a tip for a good tour. Great views from the top of the Duomo: There is an elevator, but you'll also have to walk some steps if you want to enjoy a sweeping view of Milan. On a clear day, you'll even see the Alps in the distance. An aquarium visit for pocket change: The building itself is an architectural wonder, but inside is Milan's aquarium, which you can visit for a very reasonable price. The aquarium is not far from the Lanza subway stop. Shopping for bargains in the markets: Expensive shopping is easy to find in this fashion-conscious city, but you'll also enjoy bargain hunting in the markets. Fiera di Sinigagli is among the best-known flea markets, but you can also visit one of the city's largest department stores at La Rinascente. Take advantage of Design Week: This occurs in mid-April each year, and although hotels and restaurants might be crowded, there are advantages to visiting at this time. Many places host special exhibits to cater to all the creative out-of-town visitors. Consider alternatives to La Scala: Milan is home to one of the world's most famous opera houses, but tickets are scarce and expensive for those who aren't annual patrons. If this is an essential part of your experience, start your search early and be prepared to pay top euro. As an alternative, consider a visit to Serate Musicalli, where low-priced tickets are frequently available and the quality of performance is excellent. One more window shopping opportunity at the Fashion Quad: This famous quadrangle is home to some of the most exclusive shopping on earth. This is the kind of place where you can see a $120,000 jacket or a "bargain" suit for $5,000. It's an essential Milan experience, even for a budget traveler. Go to Montenapoleone subway stop.